This has been a great day. I finally finished all my papers, there was pesto sauce in the dining hall at dinner, oh, and THE HOUSE OF REPRESENTATIVES VOTED TO REPEAL THE BAN ON OPENLY GAY MEN AND WOMEN SERVING IN THE MILITARY! The final vote was 250-175. I have been incredibly pessimistic about Washington's ability to achieve anything lately, and the extension of the Bush Tax Cuts didn't help the situation. Just in time for Christmas, though, the end of an incredibly backwards and archaic practice is in sight. We're not out of the woods yet, the bill still has to go through the Senate before getting to President Obama for final sign-off, but it seems completely inconceivable to me that anyone could still support the ban, even after the results of the survey were released. Representative Jared Polis of Colorado summed it up nicely, saying DADT is the only law "in the country that requires people to be dishonest or be fired if they choose to be honest." 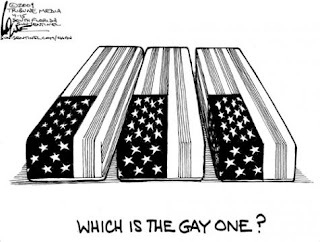 In a development that surprised no one, the DADT survey that polled soldiers on the effects of serving with closeted and open gays, revealed that 70% of the troops have worked with gay soldiers in the past, and 92% said it would not impact the way they do their job or interact with their fellow soldiers. Essentially, soldiers in a gunfight just don't care whether the soldier covering their back is attracted to men or women or both. Despite the survey, Republicans in the Senate are sure to put up a fight. John McCain, for one, has voiced concern about the survey results, and made it clear that he does not support a repeal of of DADT. Nevertheless, Democrats are "very confident" they will get the 60 votes necessary. Hopefully, lame duck senators who have nothing to do will quit playing the politics game and throw their vote behind the bill. In addition, Obama should make a direct appeal to the Senate to put aside petty politics and listen to reason this holiday season. The people who defend our country should not be punished for exercising their right to freedom and loving whomever they choose. So I know what my Christmas wish will be, that America lives up to its historic identity as a progressive country that celebrates freedom, and that we repeal DADT once and for all. To see where we stand on LGBT rights compared to other countries, check out this site or for more information on the repeal, follow the links below. The U.S. Senate passed the DADT repeal 65-31 on Saturday, ending the 17 year ban with the help of moderate republicans including Susan Collins and Lisa Murkowski and Scott Brown. A great way to kick off Christmas break! 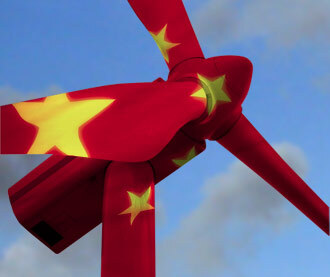 Wind turbine in Chinese 風力發電機組. Time to start learning green tech in Chinese!! Every month the US waits to implement policy we fall behind the future largest economic power in the world. Pushing business to internalize the costs of its environmental externalities, in tandem with research and development incentives in green tech will position the US economy for long-term success. Did you know that, according to the documentary Who Killed the Electric Car, Toyota developed the Prius out of panic that they had to compete in the electric market in the United States after California passed the Zero-Emissions Vehicle mandate in 1990? Because GM made a lower margin on electric vehicles and didn't think they were profitable yet across the country they fought hard against the mandate, along with other automakers, and were successful. The power of policy is inexplicable in developing the green economy. While climate change is a threat to our well-being it is not a limit on our economy! Clean energy technology might be the only industry capable of driving a new decade of economic growth. Much like the internet, before that computers, and before that bioengineering, we now have an opportunity to lead the world in technology. Unfortunately, this country cannot look past five years in making decisions. Coal states and global warming skeptics will cripple our potential to take the lead in the economy of the future. The debate needs to move from whether or not global warming is happening, to how can public policy enhance the competitiveness of US businesses in green technology. Why is the promotion of a carbon tax or a gasoline tax limited to the world's best thinkers and economists? If the trajectory of discussion does not change, and policy remains stagnant, we should all be prepared to take a seat and watch China dominate the green revolution.